It is the branch of Dentistry which specializes in the diagnosis and treatment of periodontal diseases, meaning the infections of periodontal tissues which are those that surround our teeth ( gums and jaw bone). 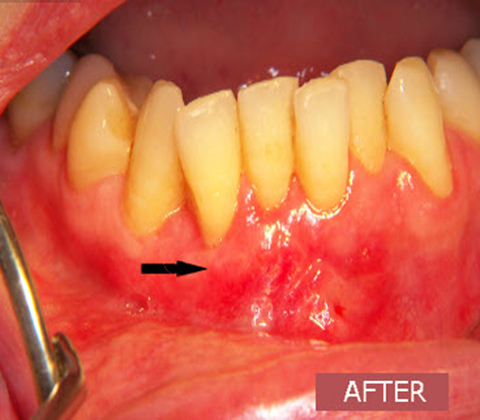 What Periodontal Diseases are and how are they caused? They are inflammatory reactions of the periodontal tissues which are caused by germ (bacteria) gathering inside the mouth, especially on the surface of the teeth and gums with the form of dental microbial plaque. It is a clear or yellowish membrane which sticks daily on the teeth and gums because of the consumption of food or drinks. If it is not removed on a regular basis with the right and effective brushing, it has the capacity to multiply its calcium by attracting salts of the saliva, so it hardens on the teeth surfaces forming into what is known as tartar. Basic characteristic of periodontal diseases, which makes them hard to find by the patient him/herself, is the fact that they are painless (except very rare occasions) and can be inherited. This means that children of parents (one only, or especially both of them) who suffer from periodontal disease, have increased chances to show signs of the same disease in the future in an earlier age and in an even worse degree or immense form. 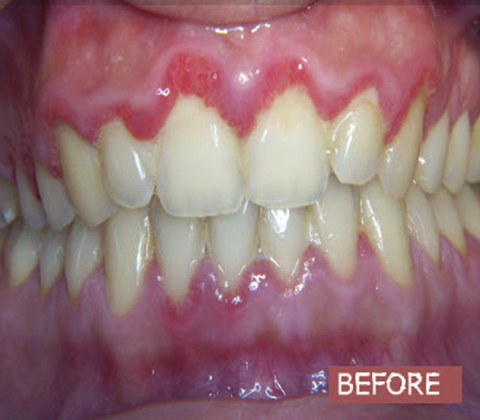 In healthy conditions, gums have a soft pinkish colour, do not bleed during brushing and are steadily connected with the teeth and between these and the surface of the teeth there is only one natural shallow slot (up to 3mm) which is called gingival sulcus. 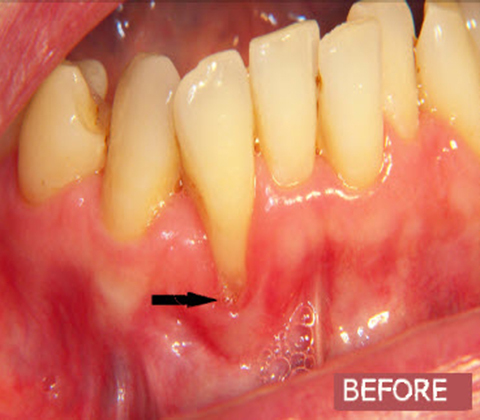 Gingivitis is the beginning of the development of periodontal diseases and it concerns the infection only of the gums by gradual penetration of the calculus (tartar) into the gingival sulcus, without having the bone affected though. 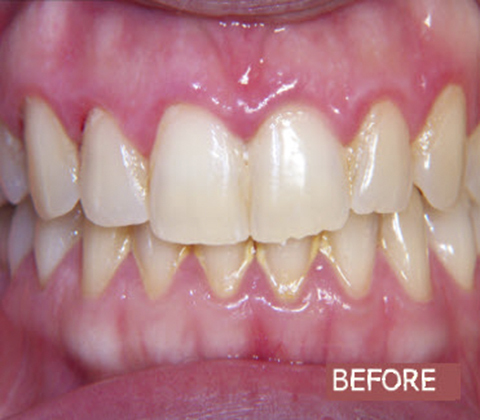 It concerns the evolution of gingivitis into a deeper damage, which not only involves gums, but also the bone of jaws that holds together the roots of all the teeth. It is established with the extensive inflammatory penetration of the gums from the tartar until the level of the bone, which is eventually infected, resulting to its gradual absorption and bone loss around the teeth. This finally leads to teeth mobility, ending into their apoptosis (loss). 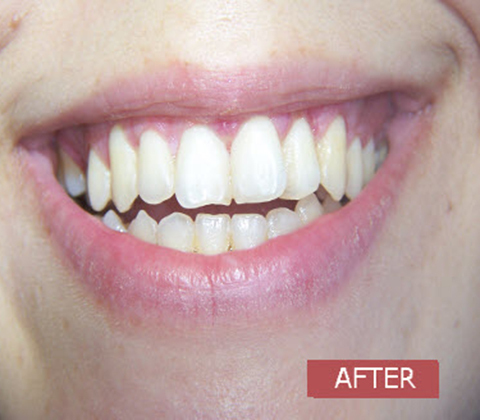 This is why the periodontal disease is constituted as one of the main causes of teeth loss and can be appeared to a great percentage of adult population, almost without any alarming symptoms. If it is early diagnosed, it can be treated successfully. Smoking:it has been proven that smokers develop more frequently deeper and more intense periodontal defects in comparison to non-smokers. Also, in smokers the signs are not very distinctive or obvious as in non smokers, making the diagnosis even harder (e.g. the smokers’ gums do not bleed). The quitting or even the reduction of smoking instantly improves the result of the treatment. Oral hygiene (brushing): it is the main factor affecting the outcome of whichever periodontal treatment from the patient’s side. 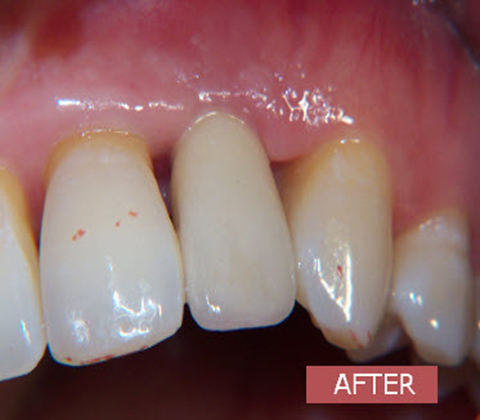 The daily and effective removal of microbial plaque from the patient himself guarantees the treatment’s success and the longterm maintenance of the desired result. The right way to brush your teeth is taught by the periodontist and it is the most critical part of the whole procedure. Stress: it is proven that during intense psychological stress, the already infected periodontium is damaged even more, followed by painful ulcerous lesions on the gums. Diabetes Mellitus:the relationship between diabetes and the periodontal disease is dependent on each other. This means that not only the uncontrollable diabetes triggers the periodontal inflammation and slows down the healing process after the treatment, but also the periodontitis itself negatively affects the sucrose levels in the blood circulation making its adjustment harder, even by the intake of special medication. Hormonal changes: it has been noticed that during puberty or pregnancy when various hormonal level ups and downs occur, gums become more sensitive and vulnerable to inflammatory reactions. Systemic medication(medicines on a daily basis): it is widely known that many medicinal supplies subscribed for the treatment of various diseases directly affect the gums, having side effects such as gum hyperplasia or reducing their defense mechanism. Existing dental reconstructions (e.g. 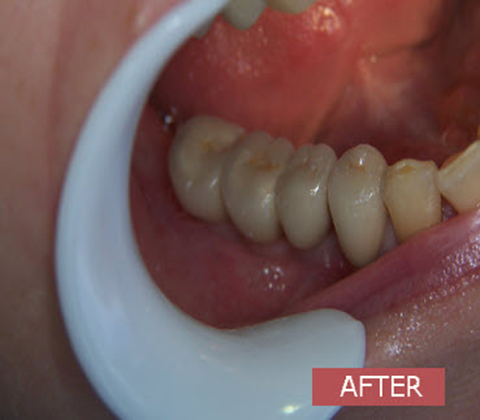 fillings, crowns etc): it is one of the main factors not only for the achievement of the periodontal success from the beginning, but also for the avoidance of possible future recurrencies of the periodontitis, just like in cases of botched dental restorations. Bad oral habits: like clenching or grinding of the teeth, especially during night sleep ( bruxism ) or spasm of the muscles of mastication ( trismus ) and inability of full mouth opening. General health condition: it is the defining factor for the outcome of whichever periodontal treatment and it is acquired strictly through the medical record and always with the cooperation and communication with the general doctor of each patient. 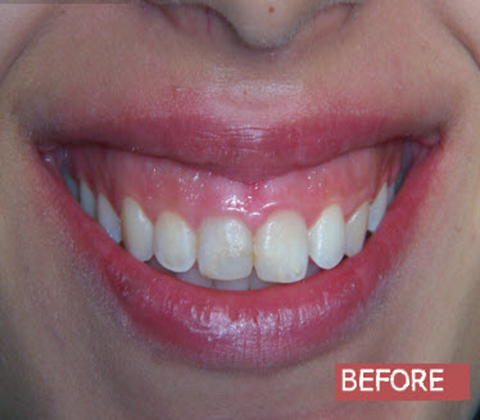 FOR THE TEETH PRESERVATION IN THE MOUTH OF EACH PATIENT (it is preferably better and wiser for someone to keep his own teeth rather than having artificial ones; it costs less, there is no need for spending much time on the dental chair and it is more convenient for every individual). 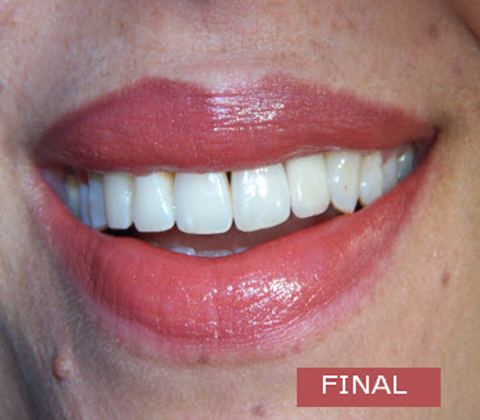 FOR ENDING THE CONTINUOUS DAMAGE OF JAW BONE AND FOR ENSURING ITS EXISTENCE IN A HEALTHY SHAPE AND FORM (the healthy and uninfected bone, even if being shorter because of a pre-existing inflammation, can maintain not only the already existing teeth, but also those which might need to be implanted in the future – it is the guarantee that whichever dental operation takes place, it will be successful). FOR THE OVERALL PROTECTION OF OUR HEALTH (it is now proven that the bacteria causing the periodontal diseases are able to lead to the faster accumulation of atheromatous plaque inside the arteries, fact which is especially dangerous because it increases the possibility of having heart attacks or strokes. It is also connected with lung diseases (such as chronic obstructive pulmonary disease), Alzheimer disease, erectile dysfunction in men and, in some cases, in pregnant women it has been related with premature childbirth, underweight infants, and a greater chance of abortion. 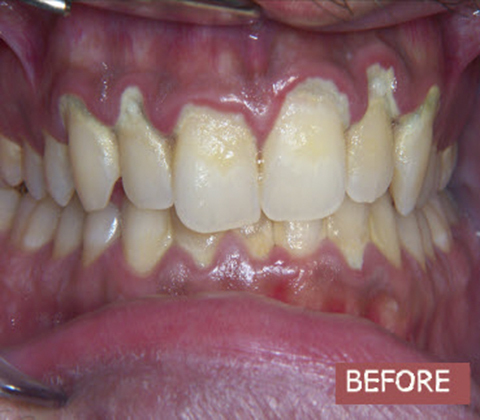 Conservative periodontal treatment: it is the most defining phase, as through this the removal of inflammation and infection is succeeded in such satisfactory levels, that depending on the patient and his condition, the desired result can be achieved, and define the necessity or not of another future intervention. 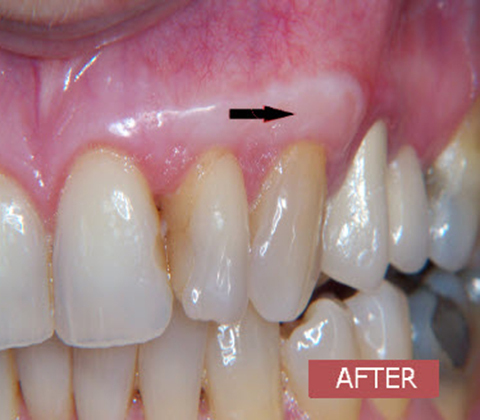 It is applied per dental quadrant and after an atraumatic local anesthesia, a “decontamination” and removal of all the existing tartar and its products takes place, aiming at creating a new healthy connection of gums with the teeth’s’ surface and the eradication of periodontal pockets. 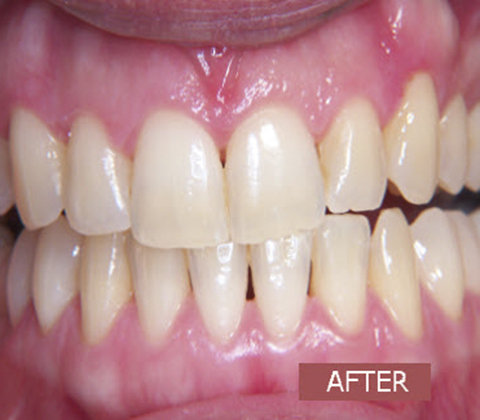 This is achieved with the use of ultrasound, hand instruments, and occasionally supplementary with laser application. It sounds worse than how it is in reality because it is somehow, tolerably tiring. 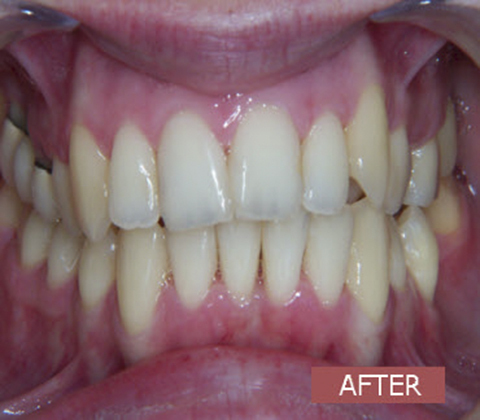 However, it is totally painless not only during the procedure but also after the end of every session. 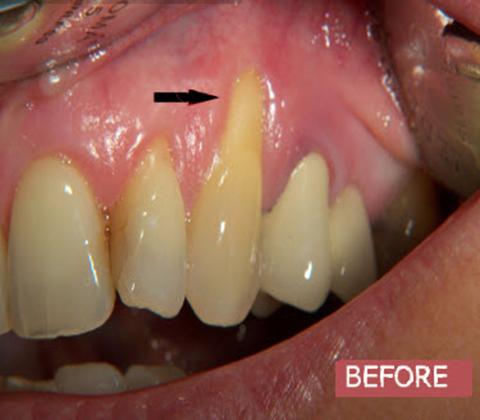 Surgical periodontal treatment: 4-6 weeks after the completion of the conservative periodontal therapy, a reevaluation and estimation of the patient’s new periodontal condition takes place, where the necessity of a future specialized surgical interference is estimated. 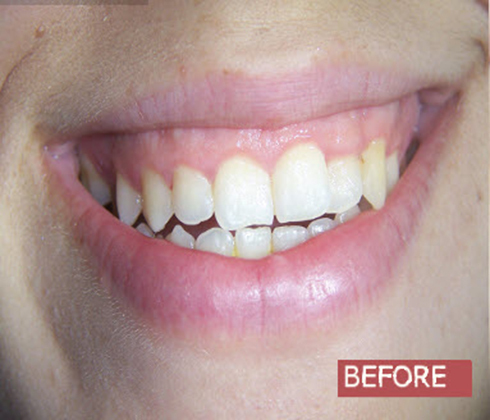 It is the most radical and guaranteed solution preferred in cases of immense periodontal defects and in cases of intense deformation of the anatomy of gums and bone. 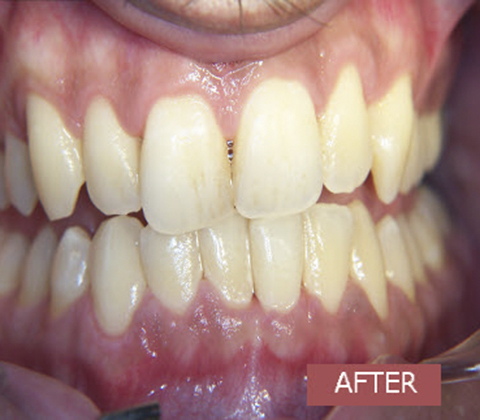 It aims at: a) the elimination of periodontal pockets and the better access to difficult areas, b) the creation of a positive architecture of the periodontal tissues, so as the appropriate conditions are ensured for a more convenient and effective brushing by the patient, c) the regeneration, where indicative, of new bone or new gums, d) surgical adjustment of the periodontal tissues (gums and bone) prior to permanent prosthetic reconstructions for the ensuring of their long term success. 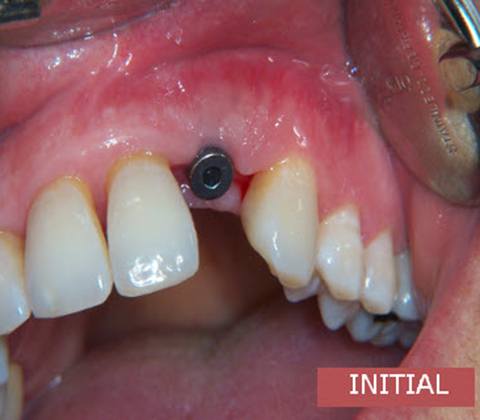 Even if the surgical placement of dental implants is not considered as a periodontal treatment, it is however placed among the surgical responsibilities of the special periodontist and belongs in the reconstructive phase of the patient’s final treatment plan. 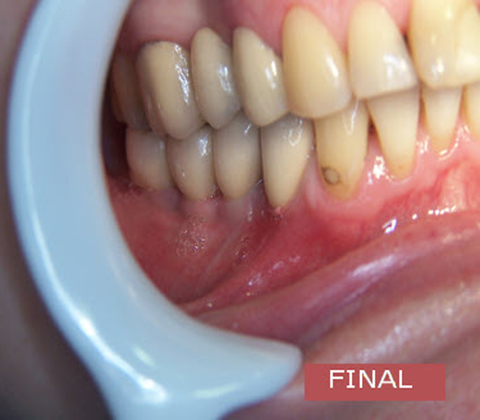 Supportive periodontal treatment –maintenance of the therapeutic outcome: it is the finishing note of all the treatments and the factor which defines the longterm success of whichever periodontal treatment, becoming an irreplaceable and valuable part of it. The reason for that is the chronic nature of the periodontal disease and the big possibility of recurrence that follows it. 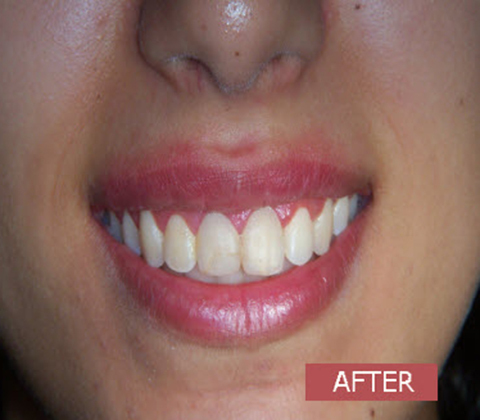 It is succeeded through regular periodontal checkups, which are arranged based on each patient’s periodontal condition and oral health. During these recall sessions, the prevention of the disease or the early elimination of new defects is accomplished. 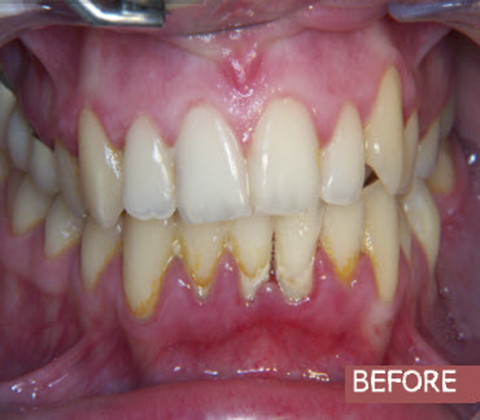 Patients who do not brush their teeth effectively, and do not comply with the oral hygiene instructions given to them, along with not following the protocol of regular check ups, are prone to reinfection and recontamination, which means more therapies in the future from the beginning- in comparison with those who are more consistent. 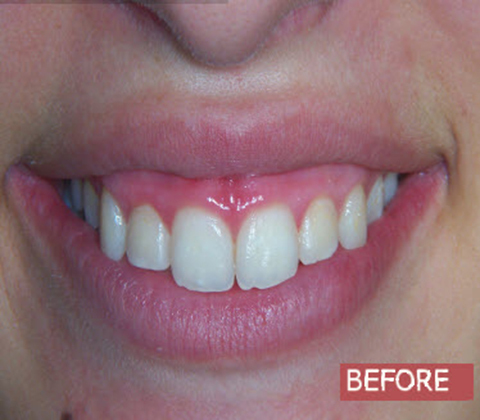 Surgical crown lengthening on teeth with inadequate height for prosthetic restoration (e.g. crown). 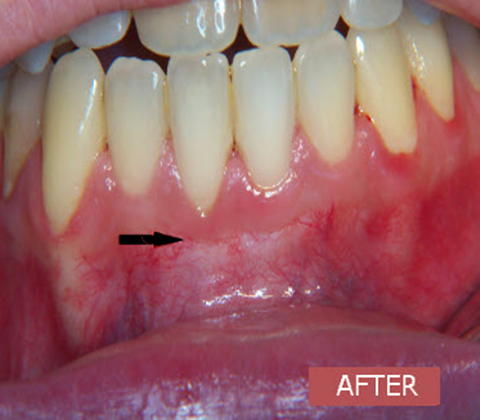 Frenectomy (surgical removal of frenulum), because sometimes this frenulum impairs orthodontic therapies. New bone regeneration ( GBR techniques), in cases where the bone loss is indicative to be regenerated. 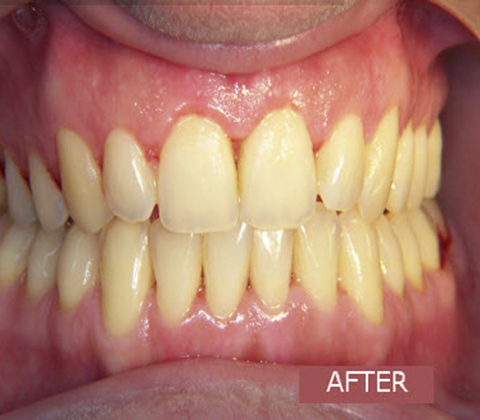 New gum regeneration, in cases of recession with aesthetic and functional problems. 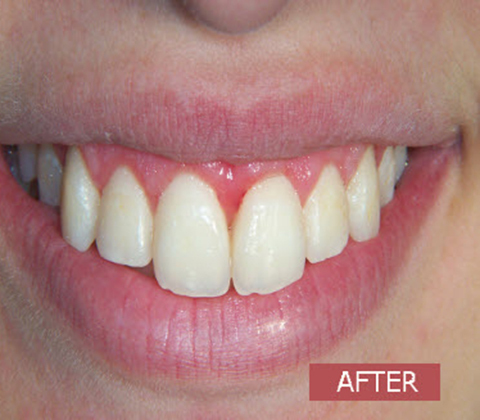 It’s when somebody smiles and a wide zone of gums becomes obvious in combination with short/small teeth. 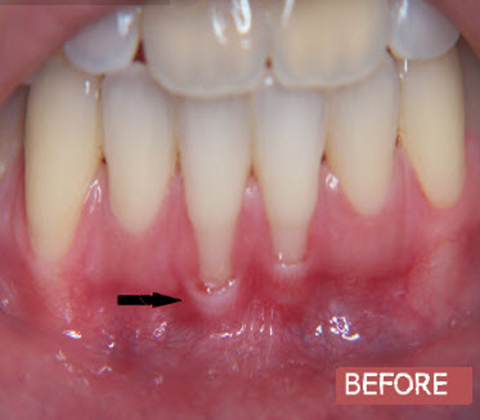 This situation causes mostly aesthetic problems and it can be fixed permanently with a small periodontal surgery, which is done under topical anesthesia. The results are immediate and impressive! In cases where the gums are receded and the root surfaces of the teeth become visible, aesthetic and functional problems occur, such as pain and sensitivity in cold. 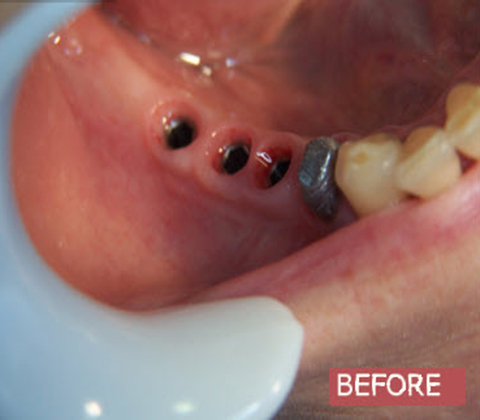 The coverage of these recessions is done surgically using a ‘gum’ graft, which is taken from another region of the same patient. 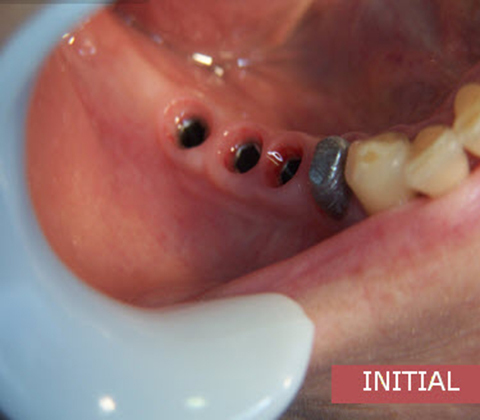 It can be associated with a new artificial root, which is made fully of titanium and in many people reminds visually the shape of a common screw. 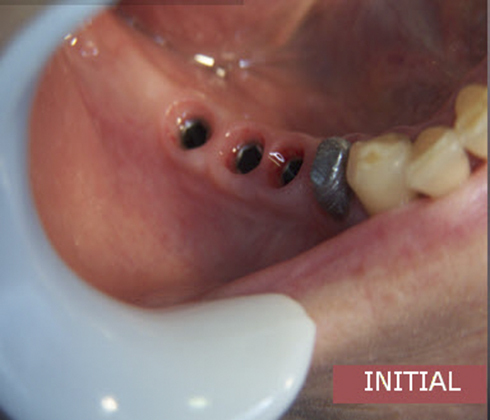 It is submerged into the bone surgically, where there is an absence of a tooth, and after the appropriate period of time a new dental crown is fitted on top of this implant- the new tooth functions normally as a physical one, without giving the feeling of ‘foreign body’ to the patient.